It is a simple application to let you control the installation and deletion of individual Windows updates. Additionally, you can fix patches and remove the bugs from the operating system with the help of this utility. With Windows Update MiniTool you can even schedule the updates on the dates and time that suite you. Simple layout with limited functions helps in getting all the work done. Additionally, it is portable, so you can use this application anywhere by accessing it through the USB drive, but you’ll have to download the window updates each time you use it on a different computer. The previously installed updates would not be retained by the application to be used on the other computers. You can even have a list of updates available to review. Based on your needs, you can select a specific update for installation and removal. It does not manage the installation or deletion process automatically. You can even disable the new updates from the list available, and you won’t see any changes of that update applied to your computer. 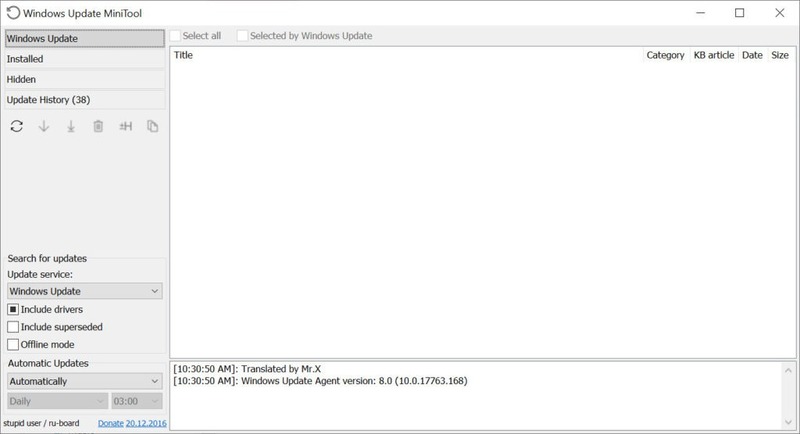 For changing the normal behavior of the Window updates, Windows Update MiniTool is an efficient application, which can allow you to disable updates, schedule them for a specific time or notify you about the new Windows updates.